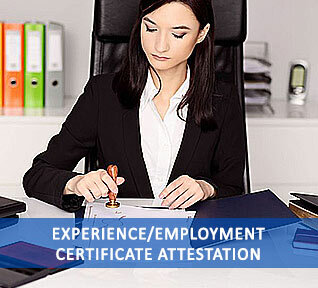 Experience/employment certificate attestation is the process of attesting your experience certificate provided by the previous employer. It is mainly done for employment purpose to go abroad. The attestation of the experience certificate hereby validates and verify your work experience. Employment certificate is provided by the employer to certify that the employee has worked in the firm for a period of time and gained experience in that field. It also provides the proof of years of experience the employee had in a particular company. Employment certificate provides information regarding the name of the organization where the employee worked, years of experience, time period of his job, designation of the employee etc. Experience certificate attestation is mandatory requirement when you go abroad in search of a job. To join a new firm, you need to provide experience certificate as a proof that you have experience in that job field. It is not necessary if you are a fresher. Employment certificate attestation is expected from experienced employees who go abroad for better employment opportunities. You can use that attested experience certificate to get better opportunities anywhere in abroad. Urogulf Global Services is an ISO certified attestation company approved by Ministries and embassies in India and abroad. We are the largest attestation company in the world with more than one hundred offices across India and abroad. Established in 2004, we provide certificate attestation, authentication and verification services. Urogulf helps you in getting your experience/employment certificate attested in time without any hassle. We provide the best attestation For getting your experience certificate attested, you have to submit the necessary documents in any of the offices of Urogulf in India or abroad. We have a team of dedicated professionals who will carry out the process without involving third parties. Great Service . Good quality of work. I personally recommended to my friend also for degree certificate attestation. I am very much satisfied with Urogulf for the certificate attestation process. Received my attested certificates on time as they have informed.